At the Missenden Abbey residential courses in 2017/18, I ran brainstorming sessions on ways to clean wagon and carriage wheels, especially for railways where a considerable mileage is covered. From the first brainstorming session, a summary document was produced. 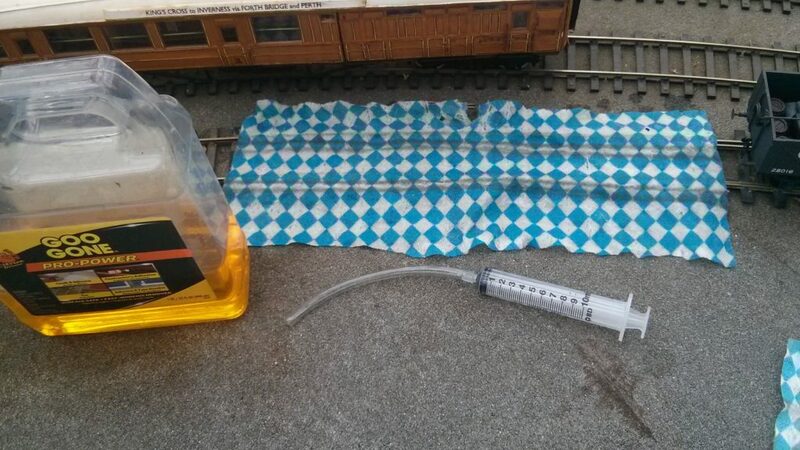 Subsequent testing of the methods resulted in two front-runners: a method for running a whole train over a thin absorbent cloth soaked in a solvent such as IPA, and a design for a motorised wheel cleaner where the wheels on one side are turned and the wheels the other side bear on a brass brush for cleaning. 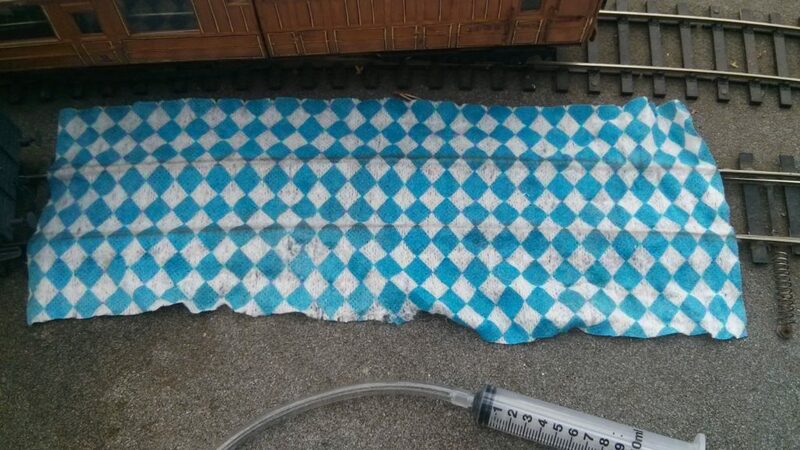 Clean dry cloth placed over track. 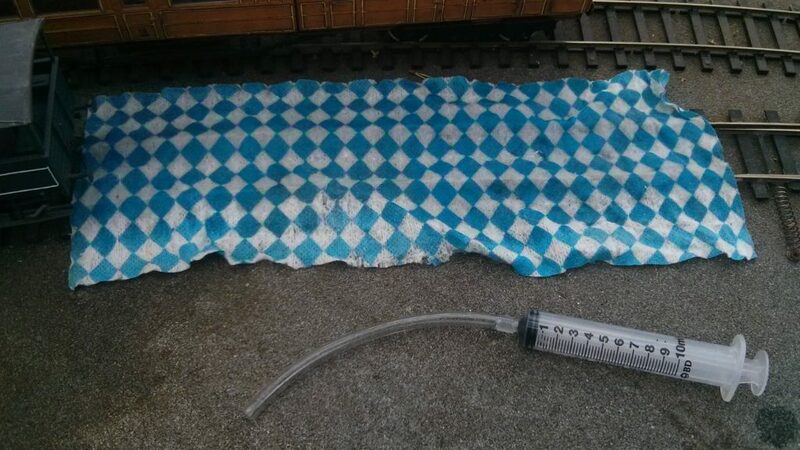 IPA solvent soaked into cloth using a syringe applicator. Metal wheels only! 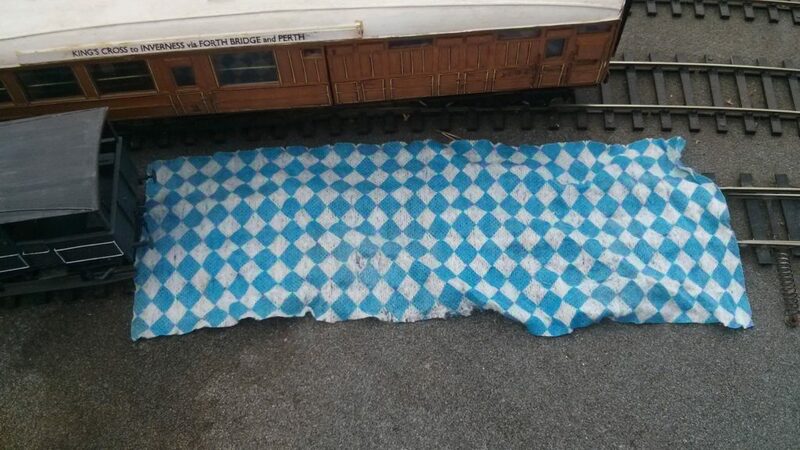 Whole train of wagons pulled over the cloth multiple times. Resulting dirt on the cloth. Additional dirt transferred using Goo Gone, a stronger solvent from the USA. The design was aimed at being able to clean the wheels on both sides of a wagon without having to turn it and preferably keeping it in-line with the tracks. Using a rubber toothed belt to drive both wheels on one side, the other wheels would rub on a brass brush. A second belt and brush but swapped over, would clean the other wheels by just moving the wagon along to the second belt. Power for the motor was to be taken from the track by fitting copper-clad collector strips under the device. 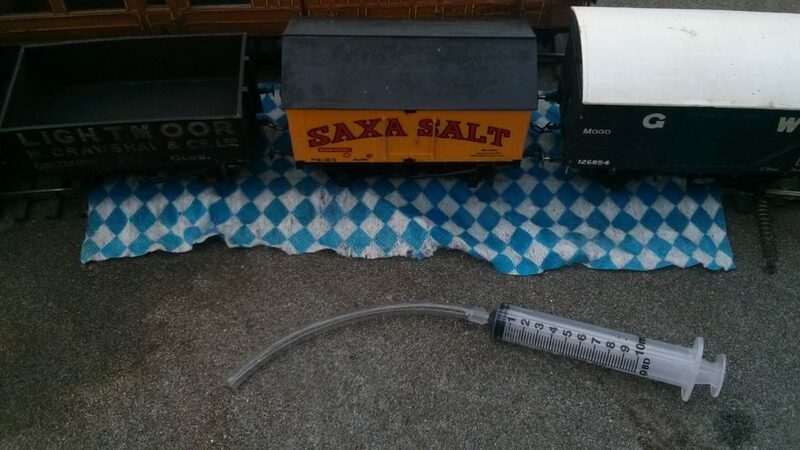 In this case, power was provided by a discarded O gauge motor and gearbox, which resulted in 3/16″ axles and bearings. Toothed belts and nylon pulleys were purchased and the pulleys drilled to 3/16″ and grub screws fitted. A single 4″ x 10″ sheet of 0.032″ thick brass was purchased, drilled, cut and folded up to form a rigid container. 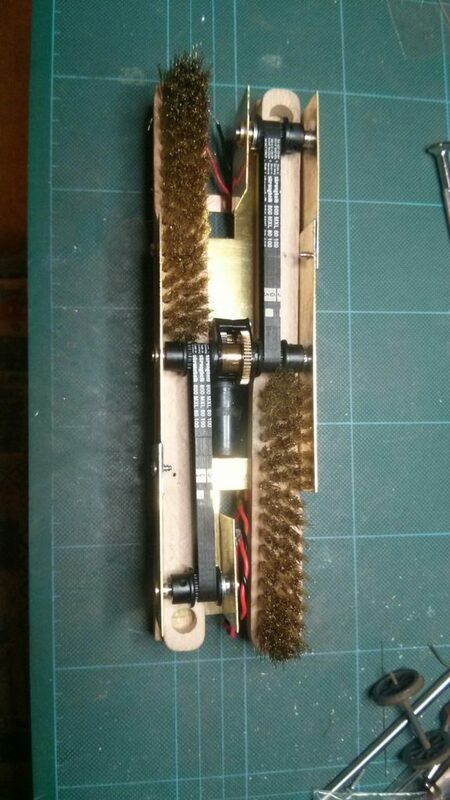 Three sub-assemblies were used with bolted joints to allow adjustment for tensioning of the belts before soldering up. 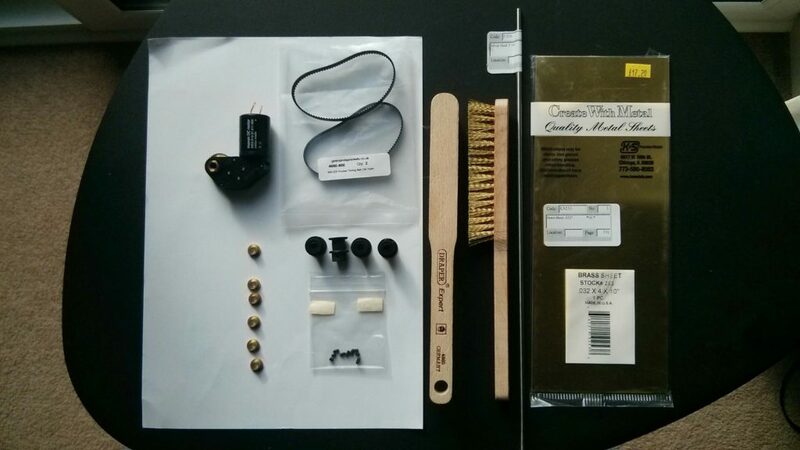 Most of the parts used. to have a wider belt so positioning of the wheels is not so critical. A single belt drive with brushes mounted on both sides of it. 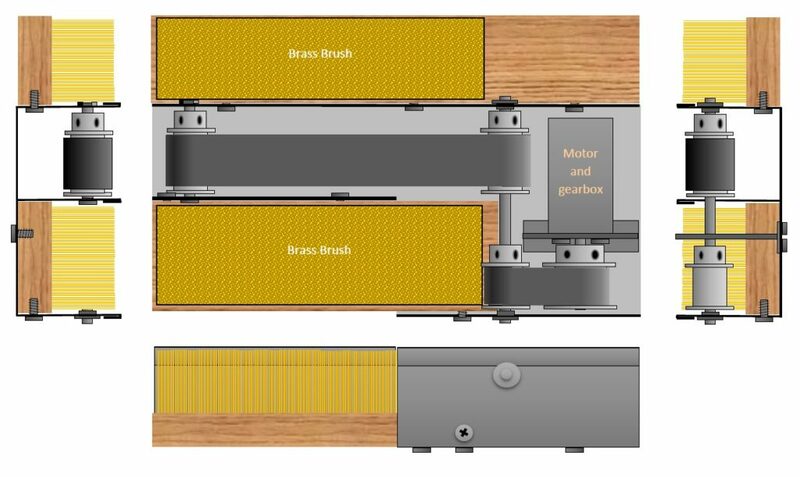 A low-cost motor and gearbox. 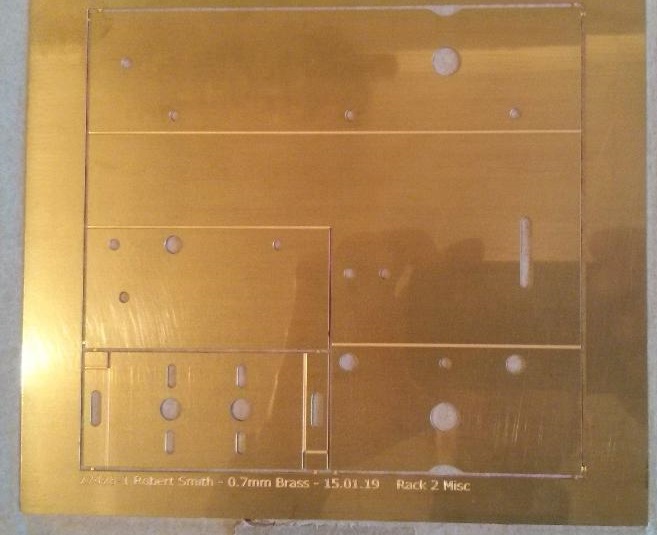 An etched-brass kit for forming the supporting structure.